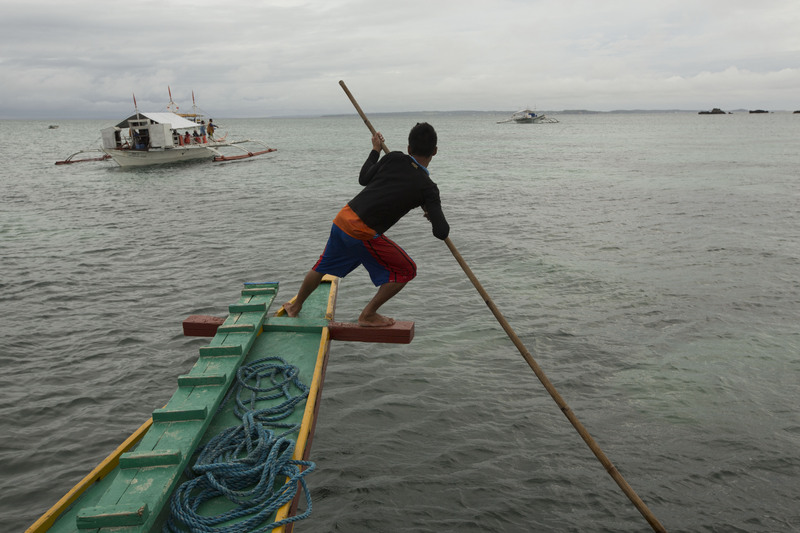 We hadn’t been back to Malapascua since Typhoon Haiyan and the very recent Typhoon Ruby had hit the island. We wanted to return to one of our favourite places; and show some support for the local economy. Of course I’d by lying if I said it was solely for this; as of course we wanted to see our friends there and the Thresher sharks again too. We headed from the Gold Coast to Singapore, via an all nighter in Manila on Christmas Day. We arrived in Cebu about 4.30am to await our four hour drive to the port to take the forty minute boat ride over to the island. Needless to say there was no roast turkey and cranberry sauce this year for Christmas, but instead something that resembled a vegetarian curry on the plane and a moderately cold beer was as good as it was going to get. The journey was more painful than previous years and I yearned for sleep! Our mates Nick R. and Shannon L. were there on the island to greet us and Tom W. showed up later that afternoon. We decided not to dive on the first day and spend the afternoon getting the rebreather and camera equipment set up. 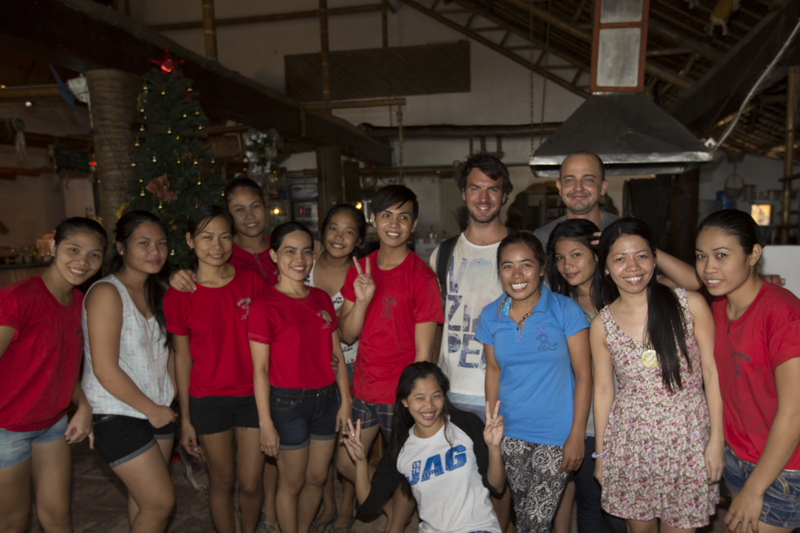 It was so nice to be greeted with big warm hugs by the staff at Thresher Shark Divers and to see their smiling faces once again, especially our favourite girls Riza our dive guide and friend and Cecil who makes the best cocktails on the island and also has the best smile you have ever seen in your life. The first two days of diving Monad Shoal for the Thresher Sharks I encountered equipment issues with my RED camera. First one was due to a faulty battery, which in hindsight was a blessing because that problem could easily be overcome. The second issue was the screen not syncing with the RED which meant I was literally shooting and hoping for the best by guessing the exposure. Needless to say the footage came out too dark and wasn’t usable. But I did fix the syncing issue. Monad Shoal has a few cleaning stations on it and the good encounters are usually at thirty to thirty three metres with another cleaning station down at forty metres. You are not permitted to take video lights or strobes. If you get lucky you can see them heading up to breach or hanging around the first ledge at fourteen metres where there is a lot more light, and its much easier for Photography. However, the first dive I had at Monad Shoal, although cameraless was simply fantastic when near the end of the dive three Thresher Sharks came in and circled me about a metre away. It was the first evidence of the CCR really coming into it’s element. 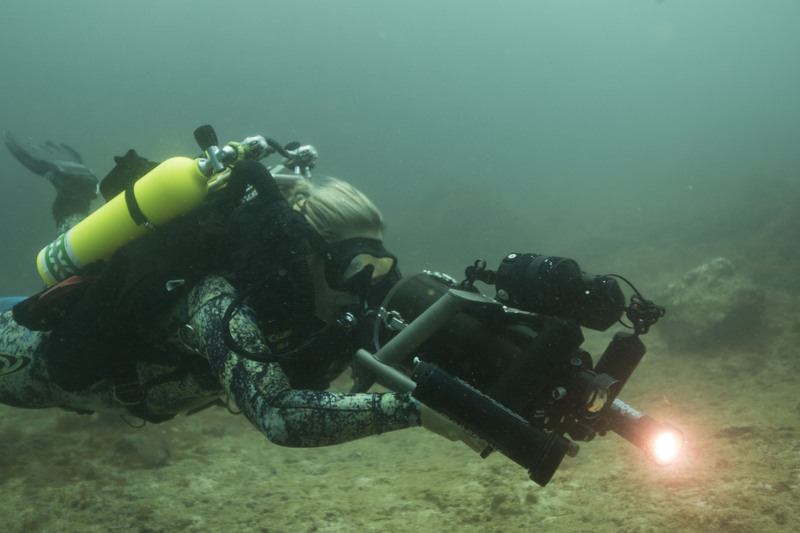 I looked eagerly around hoping that someone was filming me with them but the open circuit divers were all far shallower and only one other diver witnessed it. There was evident of the damage the Typhoons had done to the muck dive sites in particular, such as my favourite site Bantigee. It was a real shame to see them smashed up and to have a huge difference between the amount and type of critters we had always seen in past years and what there was there now. The last time we came you simply couldn’t snap the camera fast enough, every few seconds Riza would be pointing out another amazing and weird creature, but this time we only saw a few. In saying that the Thresher shark encounters we had this trip were better than we have ever had before, with plenty of Thresher sharks and encounters lasting longer and being closer. 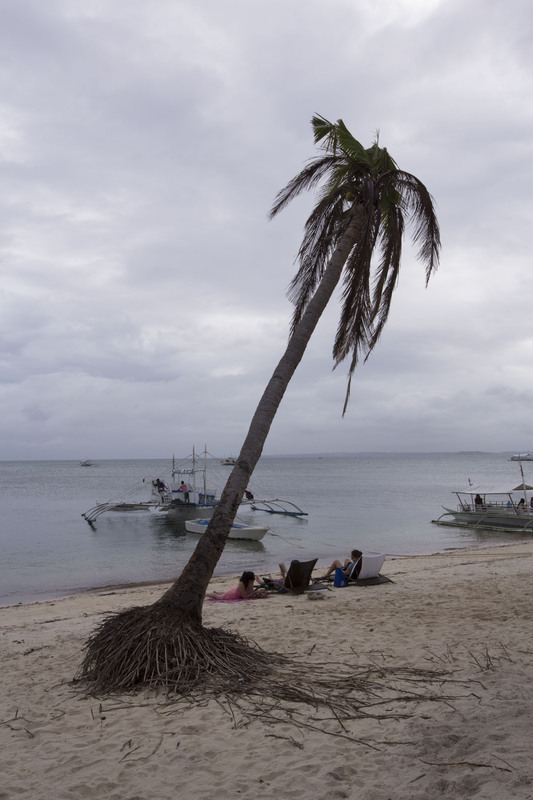 There was still plenty of rebuilding going on in Malapascua, there was a scarce amount of trees now on the island. Some of them ripped up by the roots still sitting dead on the sand. On the 29th a storm set in and we encountered torrential rain and winds. I was completely ill prepared for this and had not even brought a warm top let alone a rain jacket. Luckily Riza lent me her jacket and myself and the boys stayed in for the day and drunk cocktails and played Foosball and pool at Malditos which was pretty fun. The Shark dive was cancelled on the 30th due to weather but fortunately it cleared up quickly in the morning and we were able to get out to Gato Island which is a day trip and one we always thoroughly enjoy. There was a bit of current so the usual explore in the cave was more like a glimpse as we shot through pretty quickly. We saw a few banded Sea snakes, White tip sharks and critters but again noticed the difference the Typhoons had made with the absence of the usual Sea horses, Ornate Ghost Pipefish and Frogfish. We also headed out to the beautiful Calangaman island for the day where we had a bbq lunch on the pristine beach and a lovely swim. Calangaman reminds me a bit of Tubbataha reef and is a wall dive coated in soft corals and critters. The boys saw a school of Jacks in the blue. It is always a brilliant day out here. We also took some photos of us holding a New Years Eve flag and Philippines flag underwater which was hilarious! Especially when for the most part the NYE flag was upside down and the Philippines flag was upside down which apparently means we are declaring war…oops! We deleted those photos! Back to land to celebrate New Years Eve and we had arranged a private charter for New Years day to take us to Monad Shoal and to be the only group out there, as all other boats were not going out due to New Years Eve being a very important celebration to the Malapascua people and a time for church and family. I was very excited about this and knew it would give me the opportunity I needed to get some close footage of the sharks. We had a beautiful dinner at a local restaurant called Ging Ging’s, five main meals and a cocktail each which came to seven hundred and fifty pesos or about twenty dollars Australian for everything. We headed out for a few four dollar Caipiroskas before Nick pulled the pin for us early due to the shark dive being at 4am. Off to bed like Granny and Grandpa, let’s hope it’s worth it! Like a child on the morning of Christmas I couldn’t help but have a huge smile on my face with excitement as we headed out to Monad Shoal. It was still dark and there were millions of stars in the sky which meant clear skies and much better lighting for filming. As we headed out some dolphins surfaced near the boat and Blue Marlin were spotted by the boat crew. One of the boys pointed out a cloud in the sky shaped like a Thresher shark which I thought could be nothing but a good omen. Nick R. had managed to show up despite a big night but Tom and Shannon were still recovering, so there were even less of us on the boat, fine by me! As I was diving CCR and Nick Sidemount and we had the site to ourselves we had planned to do approximately a ninety minute dive. As we descended we spotted two Threshers circling on the top ledge straight away. We hung out on the top ledge, where the light was better for a while before heading down to around thirty metres. Nick kindly kept a good distance from me so I could get closer to the sharks on the Rebreather. I lost count of how many Thresher sharks I saw, two circling me, then one after another coming straight towards the camera, I couldn’t help but smile as I saw them on the screen. I also saw four Tuna, a school of Batfish, a family of four Lionfish, a school of Catfish, a huge Unicorn fish being cleaned, and some Moray eels. Ninety minutes and we came up absolutely pumped after what I could only say was the perfect dive. I actually felt quite emotional on the safety stop looking up at the calm surface, streams of sunlight bouncing off the water and shining down on us. If nothing else was to go right during the trip but this dive, I would be happy with that! Catching up with all the boys later that morning on New Years Day, everyone seemed to have an interesting and fun New Years Eve. I was the most impressed I had ever been with a dive operator on this trip. 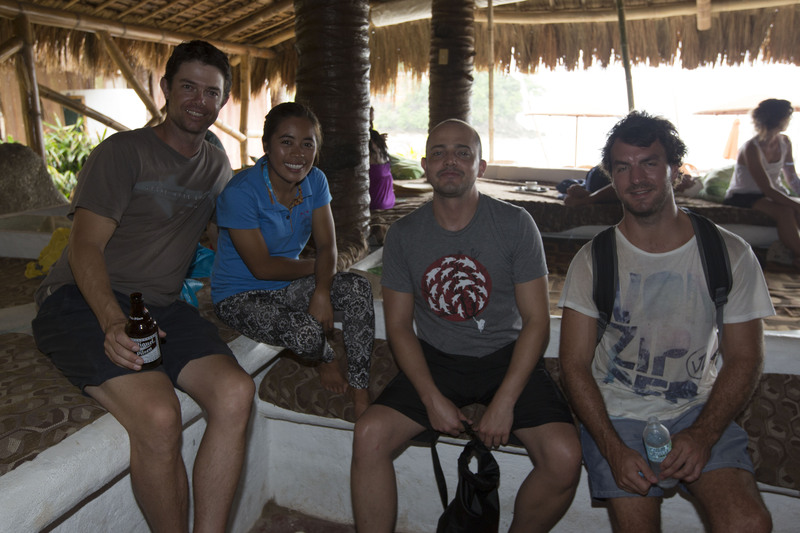 The manager of Thresher Shark divers was so accommodating to all our needs and wants and the dive crew were unreal. Even climbing up the ladder in a CCR and bail out was made easy as the dive crew leant over the side and helped take some of the weight off me by lifting the handle. Within days of the trip the dive crew were pretty knowledgeable about how I wanted things done with the CCR and the camera equipment. I even gave up gearing up my own bail out as it was just easier to let them do it and they seemed interested in getting involved. On the last day of the trip we had planned to go out on Riza’s uncle’s boat like last time, skippered by her father and with her brother, we planned to tour the island. Unfortunately yet again the weather turned to custard and it was wet and dreary so instead we got all packed up and arranged to have some farewell drinks at Malditos bar. It was a lovely day hanging out with Riza, who had already gotten the day off to spend with us. We had some amazing four dollar Cairpiroskas, and Caipirissmas, delicious curries which we shared the leftovers with the local dogs, and a few games of pool. Riza had made a traditional dessert for us called a Mango Float, and her little three year old sister and little brother came over to drop it off for us in the pouring rain. When they arrived they were drenching wet, and it was so amazing they had made such an effort to do something so nice. The dessert was delicious of course! Off to Oscars bar next to say farewell to the staff there and take some photos before departing the island. 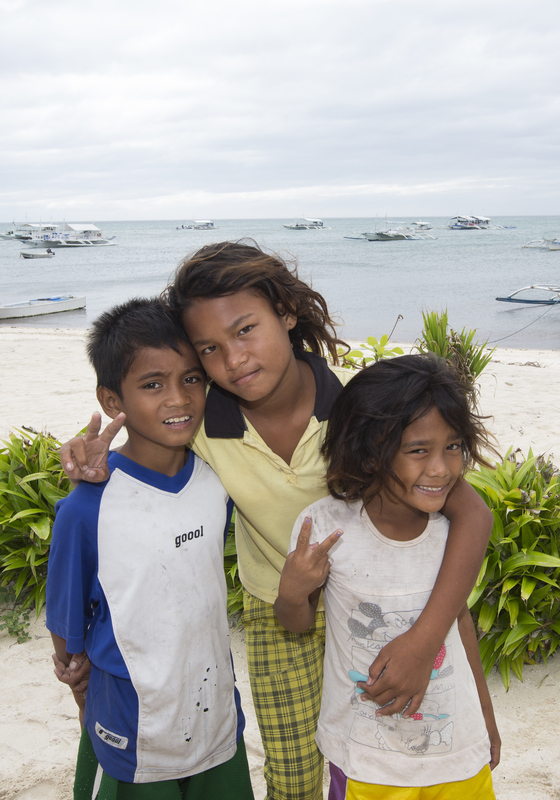 The Filipino girls love getting their photo taken. Girly screams and giggles fill the air whenever a photo opportunity presents itself. The Filipino’s have the best attitude and sense of humor. They don’t let things get them down and always look on the bright side. Things that we might smile at they laugh out loud about and even if you have no idea what they’re laughing at you can’t help but giggle because it’s infectious! The kids on the island are super cute and so Photogenic. They all have the sales pitch locked down to a fine art for selling souvenirs to tourists. Usually this is frowned upon as it incentivizes parents not to send their children to school. But as it was the school holidays we made an exception. I gave a few kids some Aussie key rings with Koalas and Kangaroos on them, later that morning I saw them walking down the path with them stuck to their t-shirts. The eight dollar one hour massages on the island are unreal, better than some one hundred dollar ones I’ve had here in Australia. I certainly had my fair share of massages on the trip. A sad farewell yet again to Malapascua as we headed off to the mainland, me nearly forgetting my RED camera in my DeepX housing, luckily one of the staff came running down the beach with it! On the four hour drive to the hotel in Cebu on the mainland we made a few stops for much needed essentials. We stopped and bought some amazing pork belly from a street market, some traditional sweets and biscuits and of course our local favourite beers San Miguel Pilsners. We took a pit stop at a villagers toilet where I thought I was going to arse out in the mud on the way there, and after Nick had drunken quite a few Pilsners he decided we needed to stop and buy the biggest Jackfruit I’ve ever seen! The local woman was telling us that Jackfruit take six years to start to fruit so this fruit was most likely ten years in the making! It took her about ten minutes to carve it up, and I asked Nick what the heck we were going to do with it?! Needless to say the driver was merry as, because he was left with an abundance of food once we were delivered to the hotel! Once we finally got to Manila we only had about half an hour before boarding the connecting to Singapore. In Singapore we had planned to leave the airport for dinner as we had a few hours up our sleeves but then our luggage didn’t arrive, not even one bag out of four. So we waited some more. One hour later they made an announcement to say there had been a delay due to extra security checks. By this time I was in the lost and found queue, but Nick signalled me over when our bags finally showed up.